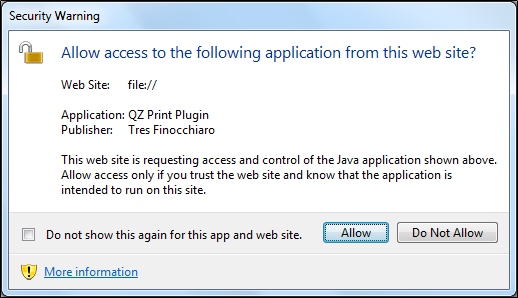 This tutorial will demonstrate how to import the certificate that is supplied with the free version of qz-print into Java, and how to properly load the applet within the browser. These steps will allow the sample.html page to properly display. 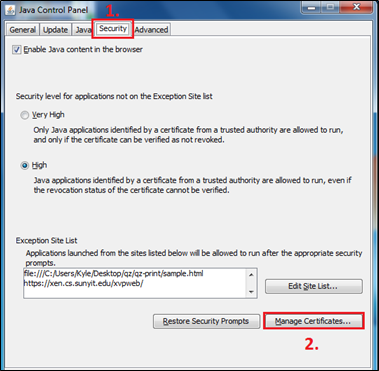 The certificates must be extracted from their zip file before they can be imported into Java. Unzip the file qz-free certs.zip by extracting it to a desired location. In this example, we are extracting the files to the same directory. Once extracted, the certificate file qz-free.csr is ready to be imported into Java. Go to the Start Menu and type java in the search bar. Find the Configure Java option and click on it. 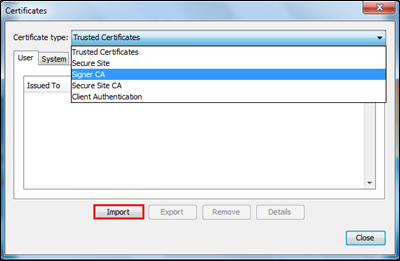 Go to the Security tab and click Manage Certificates. 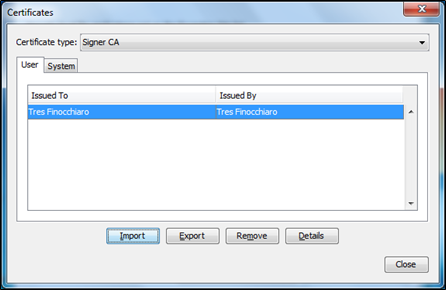 Change the Certificate Type to Signer CA, and click on Import. 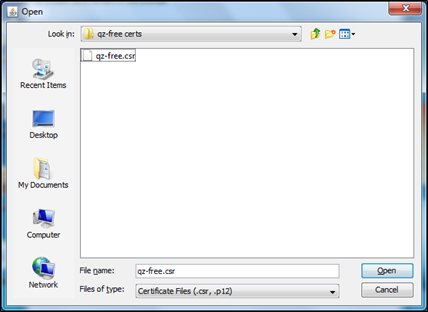 Navigate to the file location where we extracted the qz-free certs file to. When you open the file you see a file called qz-free.csr. If you see the certificate Tres Finocchario you have successfully imported the certificate! Navigate to \qz-print\dist and open the sample.html file. Click Run when the Java screen appears. Click Allow when the Security Warning screen apppears. ####Codebase Parameter If this dialog persists after after checking the "remember" checkbox, it's due to new security requirements in Java rquiring a codebase parameter which requires recompiling. After hitting allow, the webpage should turn from pale yellow to gray. If your page is displaying properly, it will look like the image below. Note: If at anytime the Java screen prompts do not appear, check your task bar for a Java icon. That's it. At this point, the applet is properly running in your browser and you are ready to move on to Getting Started tutorial, which demonstrates the code behind qz-print.